I, like most everybody else, am looking for ways to save money. In my case, we are saving for our son’s college and our retirement. Not to mention that I am just frugal by nature and don’t like to waste money. So I’m always looking for money saving ideas. I’ve found some wonderful sites with great resources, tips, ideas for saving money and I thought I’d share them with you. I hope you can find something that will help you, too. 2. https://missiontosave.com/realistic-stockpiling-tips/ – If you’re looking for ways to save on food and grocery shopping look at this post at Mission to Save. 3. http://www.sarahtitus.com/2014/02/19/how-i-get-pull-ups-diapers-for-free/ – If you’re a new parent or have a child still in diapers check out how you can get pull ups and diapers for free from Sarah Titus’ blog. 4. https://www.militarywivessaving.com/ – Check out Military Wives Savings for the best places to find coupons online. 5. http://www.homelifeabroad.com/ 2013/06/19/save-money-on-your-supermarket-shopping/ – Home Life Abroad has some great tips on saving at the grocery store. 6. http://rockabyeparents.com/best-ways-to-save-money-on-kids-clothes/ – All parents can appreciate saving money on kid’s clothes, check out Rock-A-Bye Parents to see how. 7. http://www.whatsupfagans.com/2012/08/third-times-the-charm-to-cheaper-phone-and-internet/ – Maybe you’re looking to find cheaper phone and internet service… check out What’s up Fagans? to see how. 8. http://www.sarahtitus.com/ 2014/03/29/how-to-get-nice-furniture-dirt-cheap/ – See how you can find nice furniture dirt cheap. 9. http://www.frugallivingmom.com/10-easy-ways-to-save-100/ – Frugal Living Mom has 10 ways you can save $100. 10. https://savorandsavvy.com/2015/03/100-frugal-recipes.html – Savor and Savvy has 200 frugal recipe ideas that will help you save money and something the whole family will enjoy. 11. https://www.militarywivessaving.com/how-to-feed-your-family-on-50-a-week/ – Can you feed your family on $50 a week? Check this out to see how. 12. http://twokidsandacoupon.com/2014/03/5-ways-to-save-more-money-this-month.html – Check out Two Kids and a Coupon for 5 simple ways to save more money this month. 13. http://www.littlehouseliving.com/frugal-tips-for-saving-money.html – Here’s some frugal tips that everyone can do. 14. http://thekennedyadventures.com/saving-money-on-childrens-books-30-days-of-reading-with-my-kids/ – Looking to save money on children’s books? 15. http://www.frugalitygal.com/2014/01/easy-money-saving-tips-for-beginners.html – Great swap ideas to save you money. 16. http://myfavefinds.com/saving-cash-on-your-next-vacation/ – Great ways to save money on your next vacation, from My Fave Finds. 17. http://www.frugallivingmom.com/so-whats-on-sale-a-month-by-month-breakdown-of-sale-cycles/ – Check out what’s on sale with this month by month breakdown of sale cycles. 18. http://something2offer.com/10-things-we-do-to-save-money/ – Check out Something 2 Offer as she shares 10 things she does to save money… things everyone can do. 19. http://missiontosave.com/third-thursday-repurpose-jars-get-a-second-life/ – Mission to Save has some great ideas on repurposing jars. I hope you can find something that will help you save money. Do you have a money saving tip? Awesome roundup, now I’m off to read some of these, thanks! Great roundup! I’ve bookmarked it for the future. I am always up for new ways to save money, especially on our grocery bill! That’s a great roundup! I’m definitely looking to save some money! I always love finding ways to save money and that is a great list, thanks! I dare not look… I only have a few monetary vices left. What an awesome roundup, thanks for sharing! Thanks for all these valuable resources. I save money by buying produce in season. It is so much more expensive when it’s out of season. I really enjoy coupons. Saving money is as important as making money. You can also get best deals and discounts using a gift card by GIIFT for example. Thanks for this post, I find it helpful! thank you for the tips,i saved this article. 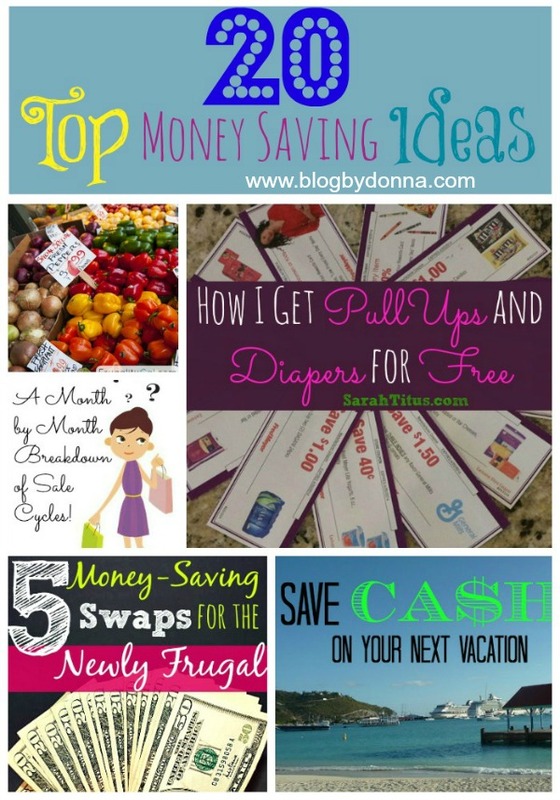 Thanks for all the links to money saving ideas and frugal blogs. Just what I needed for this expensive season. Wow, Thanks for all of the great information. I have a lot of reading to do lol. I am so looking for ways to save money on produce – thanks for the link! All excellent resources for ideas to save money. It is nice to have a list all together for future use.